If you have a website and operate a small business, it’s time to get started making your website pages load fast on mobile, or else! Those lagging behind may very well find their hard earned Google search rankings slipping away. It’s no longer enough for our sites to be mobile friendly! Looking ahead, it’s imperative we move forward by taking our websites to the next level. We have updated this post to reflect the most recent changes to Google Search and urge our visitors to take immediate action by editing their websites to work and function and display perfectly on mobile devices. UPDATE 2019: As we move forward, Google Search is more focused on mobile devices than ever before! Now, for the most part, search rankings are determined based on the mobile display of our websites while desktop devices are taking a back seat. If you want to rank in the search engines, your website had better be fast and provide a positive user experience for visitors using their small mobile devices as opposed to desktop devices. The “OR ELSE” Finally Came True! UPDATE 2017! Beginning January 10, 2017 Google is penalizing mobile web pages with interstitials that obstruct user access to web page content. Example: How Form Pop Ups Look on Mobile. Many of our clients really like their web forms to automatically pop up, slide or fade onto their page, above the fold. Sorry guys, but I suggest you remove that functionality, immediately. Not only will it adversely impact your SEO, your visitors HATE them, especially on mobile! It would be a better idea to display your form by activating it to pop up by using small button or inviting linked image. Making website pages load fast on mobile is now more serious than ever before and CANNOT be ignored! Google is also pushing for the use of Accelerated Mobile Pages (AMP) which basically is a special mobile version of each page, post or custom post type to display on mobile devices. These are basically duplicate pages of each page on your site that display only on mobile devices. AMP pages load up to four times faster because any extra unnecessary script and styling is removed. Yes, there are WordPress plugins that might take care of this for you somewhat, but as of now they still need more development. We offer web services to update and optimize your website for mobile and desktop! You’d be surprised how much difference it makes by just resizing and optimizing your images. Yes, there’s plenty that can be done and it’s up to you. We can optimize your database, configure site for proper caching, integrate with Cloudflare, move you to a faster server, add limited AMP functionality and much more. If you want your site to even have a chance of ranking high in the search results, you MUST make your website pages load fast on mobile. If you don’t hire us, we urge you to do it yourself, or hire another WordPress professional to help you. This is serious and it could have a very negative impact on your business if you do not take action. Desktop page speeds have been a ranking factor for years, but very soon they will also be ranking based on how well your website pages load fast on mobile. Recently Search Engine Land published a informative post about recent announcements by Google explaining how the speed at which your website pages load on mobile devices will directly affect your website’s placement in the search engine rankings! According to the article, Gary Illyes from Google said, this is months, but not years away from happening. You might be thinking, “but, we already made our website mobile friendly!” I’m sorry, but there’s a big difference between making your website pages load fast on mobile and making your website mobile friendly. Notice the “Designation” in the example above. Making our websites mobile friendly was primarily about appearance and ease of use. 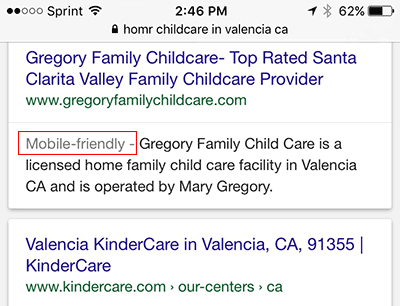 We redesigned websites to display nicely on mobile devices and we were rewarded with that all important “Mobile Friendly’ designation in the Google search results. Now, in order to increase or maintain our search engine rankings, it’s critical our website pages load fast on mobile devices. Keep in mind, it’s more work to make websites load fast on mobile than on desktops. You might say, but my WordPress theme is responsive, but that’s NOT enough! Not nearly enough. Those unable achieve fast mobile page loads can say farewell to their rankings! Lately I’ve been hyper focused and obsessed with developing plans to best reduce mobile page speeds of those websites I currently manage or develop. Some family members and associates have even accused me of over reacting, but I completely disagree! Keep in mind, mobile page load speeds will be determined by Google! Have you ever tried testing your page load speed using Google’s speed test? I have no data to back this up and I could be wrong, but I think the Google website speed test is less forgiving than other page load speed testers! UPDATE: As of 2017 I’m seeing more similar page speed test results form Google as will as other well known page speed test sites. As I said, Google’s page speed test is much less forgiving than some of the others. After you test your page speed using Google’s Page Speed Insights, try Pingdom Tools. You’ll be much more pleased with this result than Google’s, but remember, when it comes to search rankings, Google’s speed test is the only one that matters! I’m sorry, but the future of how our website pages rank in the SERP’s will have a huge impact on many small businesses. This is a BIG deal, especially to those small business operators dependent on how well their website’s rank in the search engines. Like, we don’t already have enough on our plates! So, where do we go from here? How soon must we take action making our website pages load fast on mobile? According the announcement they said Google’s plans for implementation was months away as opposed to years. That means we must start some serious planning right now. How to Make Website Pages Load Fast on Mobile Devices? As a web developer and SEO consultant I have a plan viable plan of action I can pass on to my clients. Remember, this is not an easy task! There are some websites absolutely requiring certain functionalities making it near impossible to receive high page speed test marks. On the plus side, their competitor’s will be faced with the same problem. First, test your website using your mobile device, but without a high speed wireless connection. Make sure you have reasonably good reception. Sit down, relax, and take a long and serious look at your site. Be objective and ask others for their opinions. Put yourself firmly in the shoes of your typical visitor and ask yourself if you’d bother to wait for your site to deliver content, especially if you’re on the go. Improve your site’s load times using most of the same optimization methods used for desktops, but take it to the next level. Eliminate ALL the unneeded fluff! Pretend your taking a long vacation but only have one very small bag. Remember, mobile users could care less about special effects such as animations and scroll effects. What good are all the special effects if the mobile users refuse to wait for your site to load on their mobile device? If using WordPress, avoid bloated themes and plugins. They might look great on a desktop but they are of little use for mobile device users. I’ve looked at hundreds of themes with many cool features, but most websites using those cool themes don’t use them. I still have a few clients who refuse to give up or change their image sliders. One well known company has one slider with more than 50 oversized images! That’s just insane and unless they remove all of it, they will eventually pay the price! If you’re ready to make your website pages load fast on mobile, we can help! Before you contact us please be prepared to lose the fluff and have certain functionalities removed. If your website does not absolutely need extended functionalities, we will insist on removing it! If your theme is even the slightest bit bloated, plan to losing it! Also, be prepared to lose some plugins. Sorry, but like we said, most of the fluff has got to go! You’ll soon find out, it’s no longer needed anyway. Once we finish you website re-work, your site will still look great, but with more minimal and subtle design effects. If you plan to pay us to make your website pages load fast on mobile devices, you must agree in advance for extensive changes and let us do our job. I can’t tell you how many clients insist on certain features, regardless of our advice. When it comes to page load speeds on mobile devices, there’s absolutely no choice but to heed our advice, or fail! Regardless of how you accomplish making your site fast on mobile, the end result will be the same. Remove the bloat, remove the special effects, minimize the functionalities, cache, optimize and repeat! What to Do if Certain Slow Loading Functions or Features Absolutely Must Remain? Some website owners will have no choice and may NOT be able to achieve the high page load speed marks Google would like. Take for instance the large nationwide real estate websites such as Zillow! Their website serves up homes for sale all over the United States. They have no choice but to use extensive code and files to deliver their web pages. Well, I tested their site and though they don’t have the highest mobile page speed results, it’s not horrible, given the functionality provided. I also checked their competitors and they have the exact same problems. So, when certain functionalities must remain, it will be about give and take. Just be realistic, do the best you can and be prepared to let the chips fall where they may! We published this to give our visitors fair warning about what’s to come. Most of us are way too busy operating our business than worrying about our webpages loading fast on mobile devices. Well, that’s what we are for! If you’d like to hear about how we can help you with your website, contact us today. We provide affordable online web services and offer a free one hour consultation. We’re always interested in hearing your comments. ← Mobile Friendly Website Design is Now a MUST!